The new east coast teams are mixing things up! This article was written by Kelly Ross. 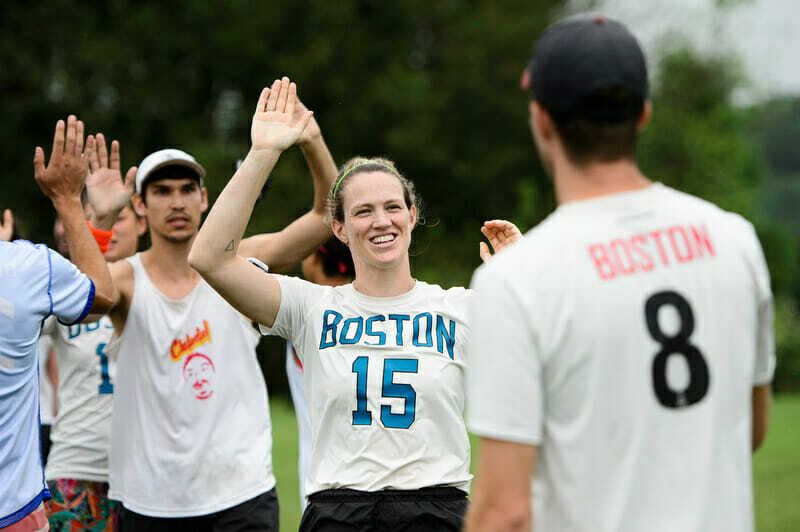 Ultiworld’s coverage of the 2018 Mixed Division is presented by Universe Point cleats; all opinions are those of the authors. Please support the brands that make Ultiworld possible and shop at Universe Point! All four made splashes earlier this season: Space Heater beat #1 Philadelphia AMP in mid-June, Snake Country took second at Boston Invite after a close final with AMP, LOCO crushed competition at two tournaments en route to a 15-0 regular season record, and Rally took second at the Select Flight Invite. After a strong Rally win against Metro North in the quarterfinals, the semifinals matched up those four teams: Space Heater vs. LOCO and Snake Country vs. Rally. LOCO took advantage of the short-handed Space Heater squad3 and a clean first half put LOCO ahead on serve, 7-6. Both teams had more turns in the second half but red zone difficulties for Space Heater and solid performances from LOCO’s Linsday McKenna and Will Hoehne led to LOCO faring better at capitalizing on turnovers. At the end of the game, LOCO’s Ryan Dealy used his height in the end zone to sky Space Heater’s Alan Kolick, sending LOCO to the final with the 13-10 win. Rally faced off with Snake Country in the other semifinal. Snake Country opened up strong with five breaks before Rally was able to hold. Taking half 7-2, Snake Country used their deep game to convert on turnovers while Rally had some unfortunate turns in their red zone. With some strong play from Rally’s Anna Wysen, Grayson Sanner, and Peter McArthur, the DC team scored more in the second half, but Snake Country easily closed out the win, 12-7. The final was set between Snake Country and LOCO. Snake Country started on offense with a quick hold after a score from captain Erin Rea. With some strong defensive pressure and a score from Karoline Hart, Snake Country went up 2-0. Regina Wilkinson reeled in some deep shots to help LOCO get on the board but despite great defense and offense from her and Jess Brand, Snake Country applied pressure of their own with goals from Lexi Zalk and Erin Rea, and Boston took half 7-3. Snake Country capitalized on a turned huck from LOCO coming out of half and then after a deep pull and a LOCO drop in their own end zone, Boston notched two breaks to go up 9-3. The breaks kept rolling in after a great heads up midfield defensive play and an eventual upline snag for a score from Chris Waite to make it 10-3. Defensive pressure led to another LOCO turn, and a fast break backhand huck from Dan Glatt to Karoline Hart extended the lead to eight. However, the LOCO team wasn’t done yet: after some great plays from Lindsay McKenna and Brand, LOCO managed to close the gap back down to 12-7. But the final hold did not elude Snake Country for long: they put in the score to claim the Chesapeake Open championship, 13-7. Comments on "Chesapeake Open 2018: Tournament Recap (Mixed)"